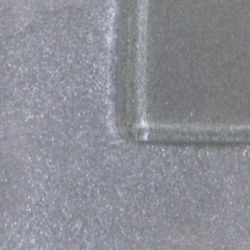 Silver Sheen is one of our Metallic Colors and fires to a slightly textured silver/pewter color on top of the glass. Mix a bit thicker than the melted ice cream consistency and be sure to "puddle, push, pull" when applying or product will appear weak and streaky after firing. When fused between layers of glass, Silver Sheen lightens and will lose the metallic look and feel and just look grey.